[Gloria] sent in Gottard. (English translation). 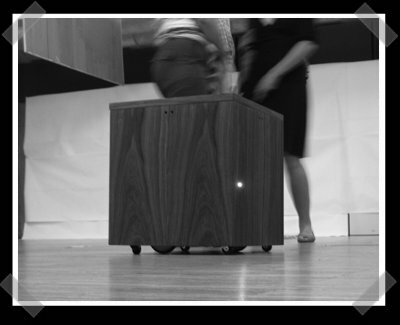 This little box is designed to act as a stool – that happens to follow people around, record their conversations and play them back to other visitors as a form of interaction. A set of rotating casters provide seating support, while a pair of gutted cordless drills move things around. An Aurdino handles the robotic functions., and an iBook handles recording and playback. Ultrasonic sensors guide the movement, and a set of LEDs roughly show how full the recording drive is. I’m not sure I want my stool following me around and recording conversations. … Or playing them back to other visitors. yeah, the recording thing is creepy (and I have better uses for hardware as costly as an ibook…) but the driving rocks. and the way in which the wheels sink into the box when a person seats itself on the stool is also nice. dood i have one of those and my tv sits on it.